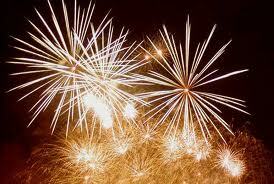 I sincerely hope that each and every one of you have a great New Year. We had planned on traveling to South Carolina but there was a last minute change of plans and we spent it here with my parents. My girls are in heaven with their grandparents here. It's been a fanastic holiday season in 2010 and can't wait to know what 2011 holds! 2010 has really been a year of starts and finishes for me. I don't want this to come off as bragging in any way. My blog is my journal and record of my projects and tutorials. I was looking back at the end of 2009 projects and I made about 55 projects. This year I exceeded my own expectations of what I could accomplish with 10 minutes here or 15 minutes there. I decided to make a mosaic of my projects. When I realized that it was over 70 items, I decided to split the mosiacs. When I count the actual finishes for the year, including the handmade gifts of scarves, bound quilts, secret projects that will be revealed next year, pincushions and tutorials....I made 94!!! Now I highly doubt that I will exceed 94 projects 2011. I suppose you could say that I have a head start with the unfinished projects laying around. They won't be counted until they are bound or completely sewn. 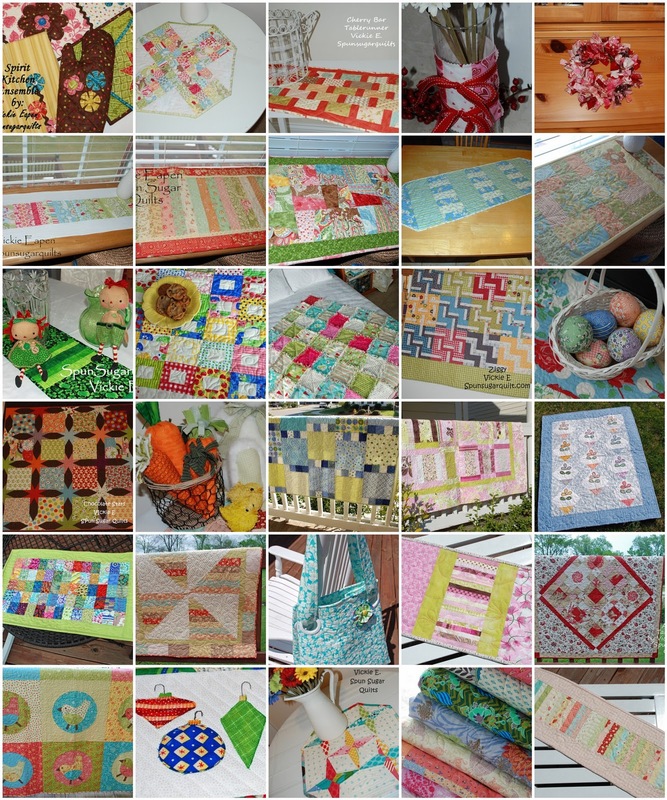 I am going to try to make a serious effort toward 94 ...but realistically...maybe 50 projects?? we shall see. It was. 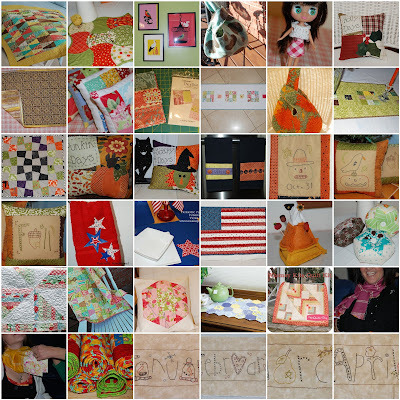 I started my blog in 2005 as Mid-Ohio Knitter. I was determined to make my own knitting patterns and tutorials. I am not sure what actually enticed me to start back to quilting more but I did. I kind of abandoned several knitting projects when I dove in quilting again. This is one of the abandoned scarves. It's knit in Manos del Uruguay kettle dyed wool which I love. I knit some while in Texas and I just can't stop knitting on it. It's addicting but surely cuts into my quilting time LOL! It's a quick scarf pattern from Interweave Knits a few years ago. ...just might finish it this year! I finished April simple stitches while we were in TX. I didn't have the cord for my camera to transfer pics. I am WAY behind in terms of blogging finishes. You may have noticed the little button on my side bar. A group of blog buddies and I have gotten together to bring you a fantastic group of projects to inspire you for this Valentine's Day! It all begins on January 9th! Spread the word in blogland. A new project each day for 7 days. 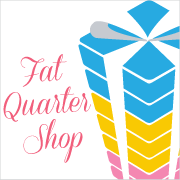 To sweeten the tour, the Fat Quarter Shop has generously donated prizes. Look each day for the post and leave a comment to win! 7 days, 7 bloggers, 7 projects and 7 giveaways!!! Can't wait for you to join us. I forgot to post the Voile scarves I made for my sisters and mom. They all tried them on. Really glad I made part of this Christmas "handmade". This is the gift package each of my staff received. There is a tiny box in there from the local jewelry store. I have to tell this story because well it really affected me. So before I tell about the handmade gifts and fun we had, please read this. I was running all around on the 21st and 22nd trying to wrap everything up for the party. We had been in TX and I was ill prepared for our return. I decided to run to the local jewelry store to pick up my order. It was 4:30 pm on the 21st. When I got there, I gave my name and said I have an order to pick up, repeated my name. I waved hello to the owner (a personal friend), while his staff went for my gift packages. When the gal returned, she began to open the boxes. I said "this isn't what I ordered". In my mind I was rushing ideas of what could have happened. I quickly looked at the tag on the order. It was my husband's name. She brought out HIS order. HIS Christmas surprise for me. Know what the lady said? "Can you just fake like it's a surprise?" I said sure....all the while thinking...just wait until I tell him. I was devastated. I knew he wanted this to be a surprise. I knew it would crush him that I saw it. So I bustle out of the store and jump in the car. I drove right past the daycare...forgetting to pick up my kids until I was 4 more blocks away. I turned around and picked up my kids LOL...thank goodness I didn't make it all the way home right? He was pretty upset. He told them to keep the earrings. It really took me the rest of the night to get out of my 'funk' from that. I showed this quilt top back in April. Some of you might remember the post. I had big dreams of making several 'seasons' of skinny verna table runners etc. I thought that if I started them back in March 2010 that I would surely get them done. Well I was able to get one season done for my staff. And this is a picture of all 7 of them. I finished the last 2 on December 22nd! I am such a procrastinator sometimes. Our party was on the 23rd. My awesome husband helped make some hors d'oeuvres and clean the house so I could finish them. They seemed to love them. I hope they weren't faking! In addition to the runners, I made Voile scarves for each of them. I used Anna Maria Horner's Voile and a free pattern from Twin Fibers. I actually made 18 scarves for Christmas. I have been working on them all year. I didn't blog about it, because they read my blog! I also gave them to all my sisters, mom, and sister in law. Here's some more happy girls. They have a secret santa exchange every year. 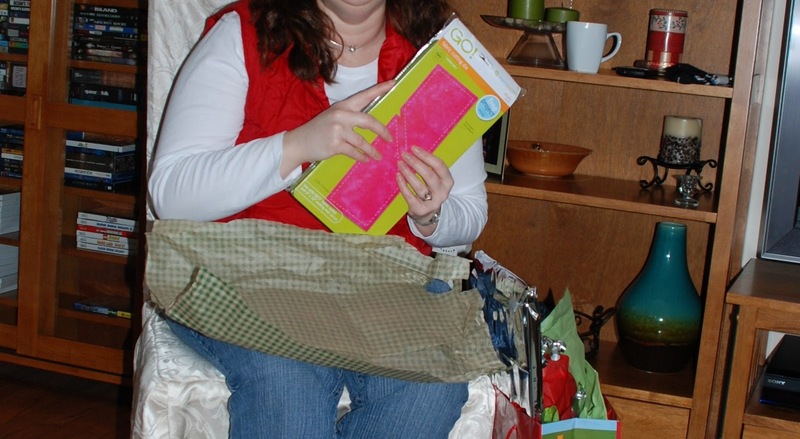 Bec got a hat, scarf and gloves plus one of my crafty staff made her an XL Hotpad after seeing my tutorial. That was flattering for me for sure. Jamie got 'Brittany' perfume...she's a rockstar! The details of this snowman were amazing. A local artist made it for Mel. And what did my awesome staff buy for me?? I was super excited to see a 3 1/2" tumbler, a chisel die, and a 2 1/4"strip die too for my bindings. I can not wait to try them. We had a great night and topped it off with dinner at a new steakhouse near our town. We had a wonderful week and evening. thanks for all the wonderful comments on the Star Drops table topper. I think I am going to take suggestions of some bloggers and make a Christmas version!! If there were more hours in the day. I have enough material to blog for a month. I just didn't have time to sit and blog it. Can't wait to though. We are here for the weekend. That is a gift in itself. 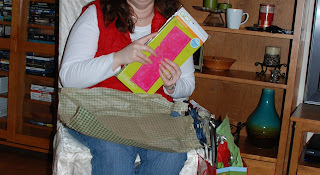 My goals are to get caught up on my sewing, blogging, tutorials and a special January surprise for all of you. In the midst of that, I will be cooking.... barely, and playing board games with my girls. Should be an excellent weekend. New project on the bakeshop! This is going to be a quick giveaway. I am on my way home today and soon as I get my bearings straight I will post a picture of the actual fat quarters. I don't have my camera cord...I know smart right? 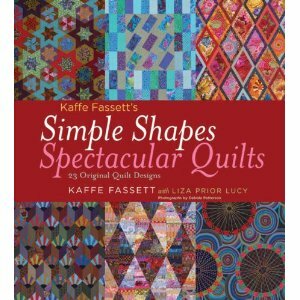 A copy of Kaffe Fassett's Simple Shapes Spectacular Quilts book. Star Drops at the Moda Bakeshop. I will select the winners by random on December 24th. Recognize this fabric line? I have been working with it on and off for a few months. 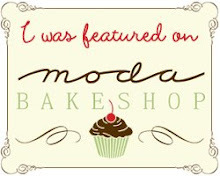 And I will have a new Moda Bakeshop project made from It's a Hoot and giveaway tomorrow. Last week I stopped at my LQS with my mother in law. I am always looking to see what new things she has since I hadn't been there in nearly 2 months. I found a few fabrics I liked, mostly for my stash. The best find, in my opinion, was the book "A Boy's Story" by Ami Downs. 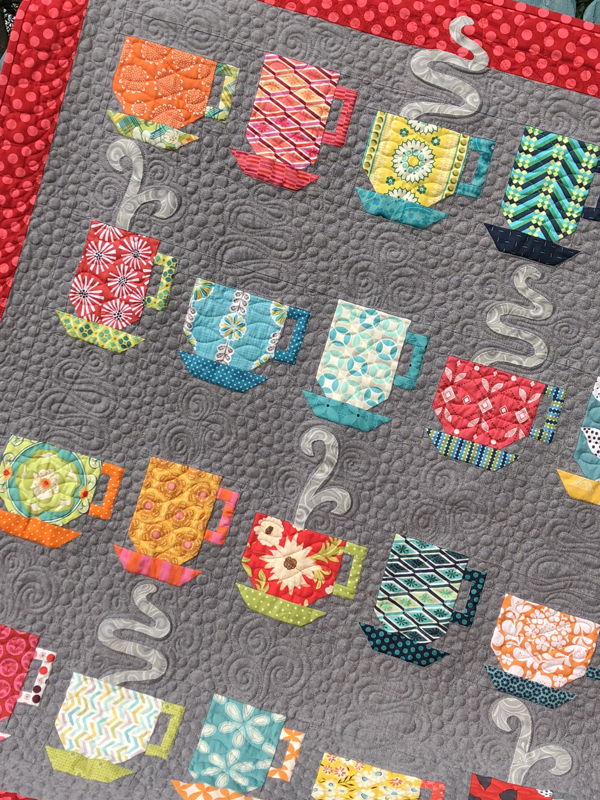 I had seen Ami's booth at quilt market and loved these projects. 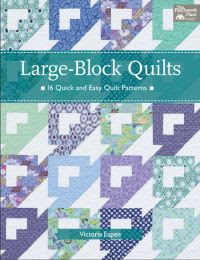 With no boy to quilt for, I passed on buying the book. Now that my sister is having a boy, I DO have a reason to have this book LOL. I am planning on putting the robot applique on a onesie. 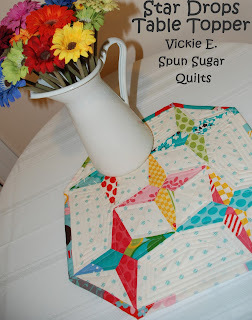 And I love this quilt too with the big stitch quilting. So if you are looking for an inspiring boy quilt book, this is it. Since we happen to be celebrating Christmas 4 times this season...my kids have gotten their Christmas presents in stages. American Girl came from my mother. And Blythe with Littles Pet Shop from my mother in law. It became an obssession for my 9 year old to clothe Blythe with more that what she came with. So Sunday evening, I dug through some of my older Lil Bratz knit clothing and original patterns for lil Bratz clothes to see how close the fit would be. To my daughters astonishment,they fit the Little Pet Shop sized Blythe doll. 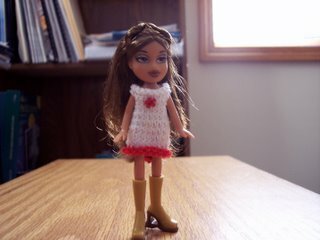 Here's the original Lil Bratz knit pattern on my blog. G insisted I take pictures of the looks. I have several items that need snaps or to be sewn up the back and they are done. I think on was a purchased outfit but my memory is pretty bad about it. If I bought this one it was about 6 years ago. I made this skirt with quilting cotton and knit the top. This dress is knit and my own design. This was another pattern I was trying.